While traveling Europe I decided to take a photo of the shoes that carried me across the world in every city I visited with (nearly) every iconic attraction in each city. 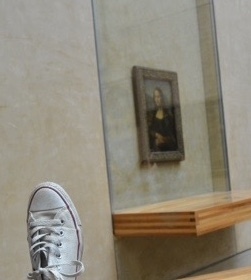 I got some strange looks when I sat down in the middle of plazas and squares to take a picture of my shoes or when I took my shoe off in The Louvre to snap a photo with Mona Lisa... But you gotta do what you gotta do. Yes, I'm wearing socks - you just can't see them. I didn't fully embrace the idea until arriving in the second country, Ireland, so the first picture is the only one I got of my shoes in Norway! An ice bar in Oslo counts as an iconic attraction for that city, right?